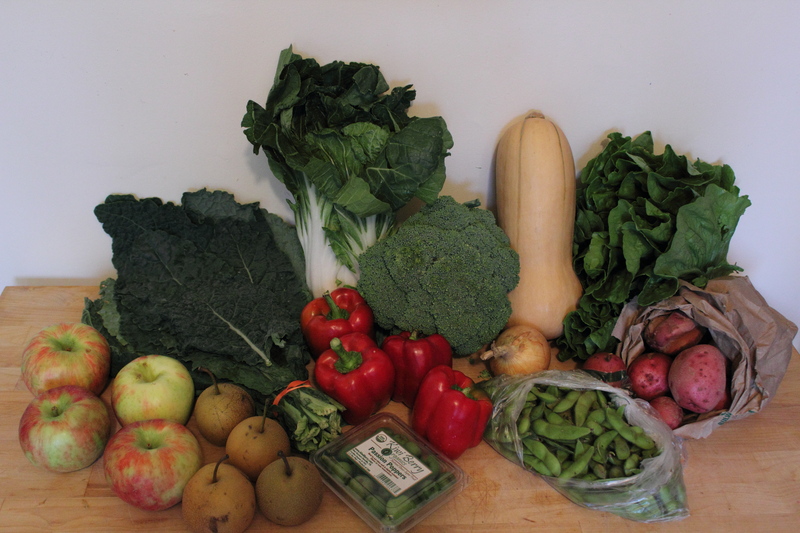 I got a lot of bok choy and baby bok choy in my basket this year, which was great because it’s a green that is easy to use in stir fries and soups. In this recipe, I tried something new with baby bok choy and sautéed it whole. Heat oil, and quickly stir fry garlic and green onions. Separate the larger outside leaves from the inner “core”, which can be left whole, and add to the pan. Cover the pan and let the bok choy steam for about 3 minutes, then cook with the cover off for another minute or two to let any extra water boil off. Not only is this veggie ready in under 10 minutes, serving the whole bok choy looks like it took way more effort than was actually required. That’s all there is to it, but if you want more details, click to read more. 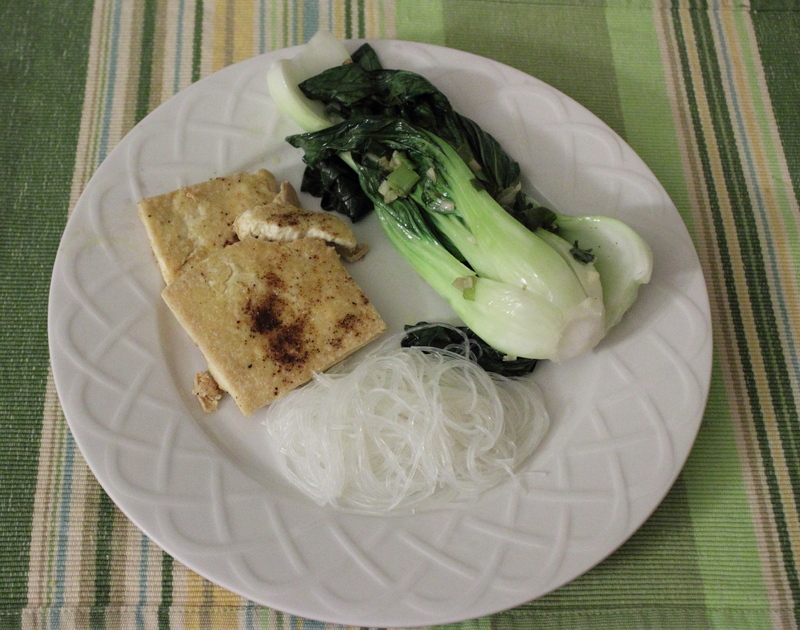 Sautéed bok choy, with fried tofu and cellphone noodles. The technique and sauce for this recipe are great bases for any stir-fry dish you’d like to make. The possible combinations of meat and vegetable are endless. First, the sauce is made by combining soy sauce, sugar, and vinegar with a bit of water. Then, the strips of meat are tossed in cornstarch and added to hot oil in a deep skillet after garlic and ginger are cooked. Lastly, the bok choy is wilted and all the ingredients are tossed with the sauce. Full instructions follow. The week of soup continues! 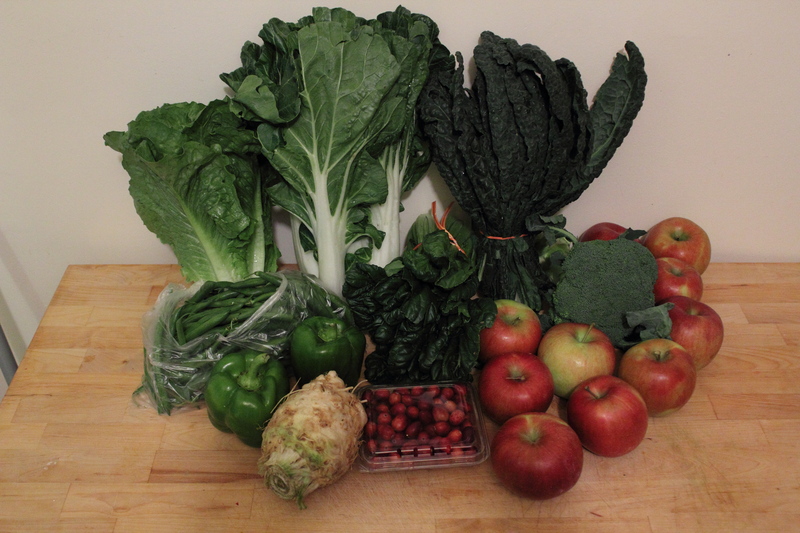 I’ve been using a lot of Asian flavors in my cooking, especially when I have lots of bok choy to use. Udon soup is a nice alternative to using bok choy in stir fries, although admittedly, you’ll be seeing lots of that as well. The soup has minimal steps. First, chicken stock is simmered with some cinnamon and star anise for a rich flavor with minimal work. 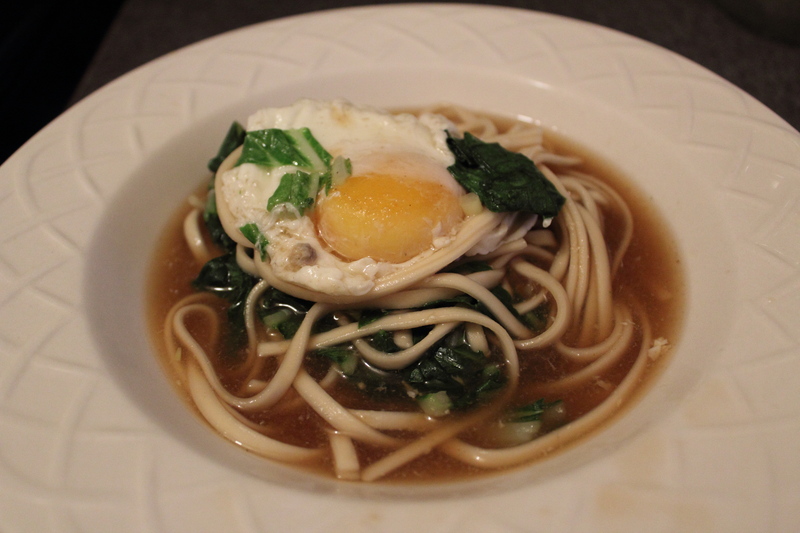 Next, dried udon noodles are added before an egg is poached right in the broth. (Check out the original recipe for directions using fresh udon noodles.) The next steps are to cook the bok choy, then garnish with green onions, soy sauce, and garlic powder. I’d strongly recommend using a low-sodium (or homemade!) chicken broth or stock for this recipe, because my soup turned out waaaaay too salty for my taste, even when using a low-sodium soy sauce. If I were to make this again, I’d use a low or no salt stock and start with a half tablespoon of soy sauce and work up in dashes from there. If anyone tries this, I’d love to know how yours turns out. 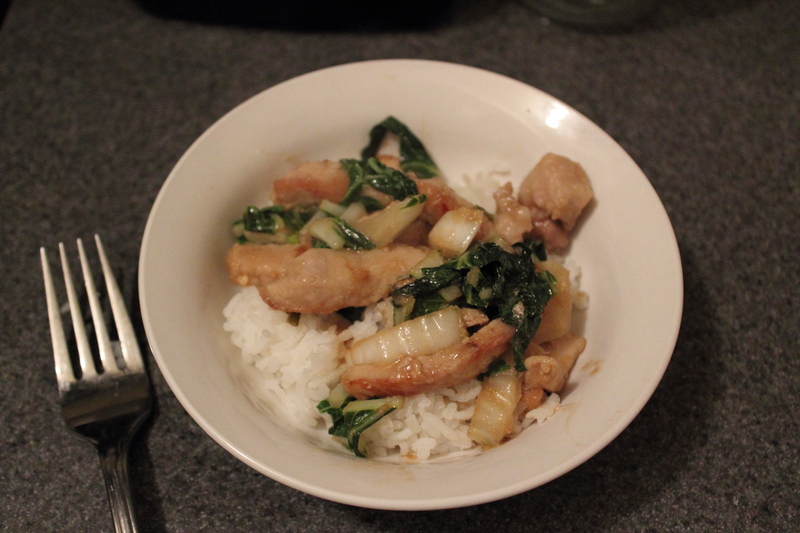 I used up my bok choy with two simple recipes this week. The first was a spaghetti with bok choy, poached egg, and Italian cheese, adapted from this Vegetarian Times recipe. I left the egg in the water for two long, and it was definitely not runny and delicious like I had hoped. Turns out, I should have cut the heat from the water once I added the egg, then removed it to dry off after the cooking time was up. Heat oil and stir fry garlic and ginger for 1 minute. Add bok choy and stir fry until wilted. Add soy sauce and cornstarch/water mixture and stir fry until bok choy looks glazed, about 1-2 minutes. Please enjoy a blurry picture of my leftovers, below. 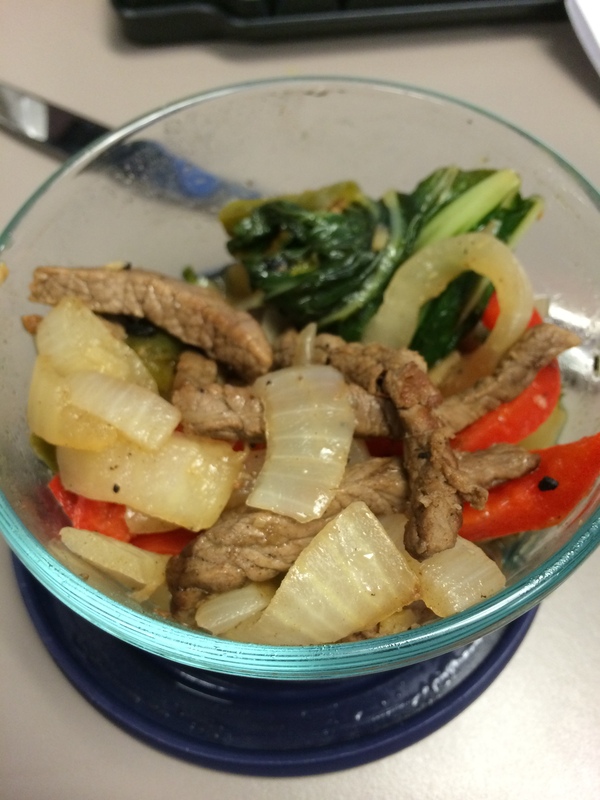 A decidedly unfancy look at lunch: stir fried beef and bok choy. 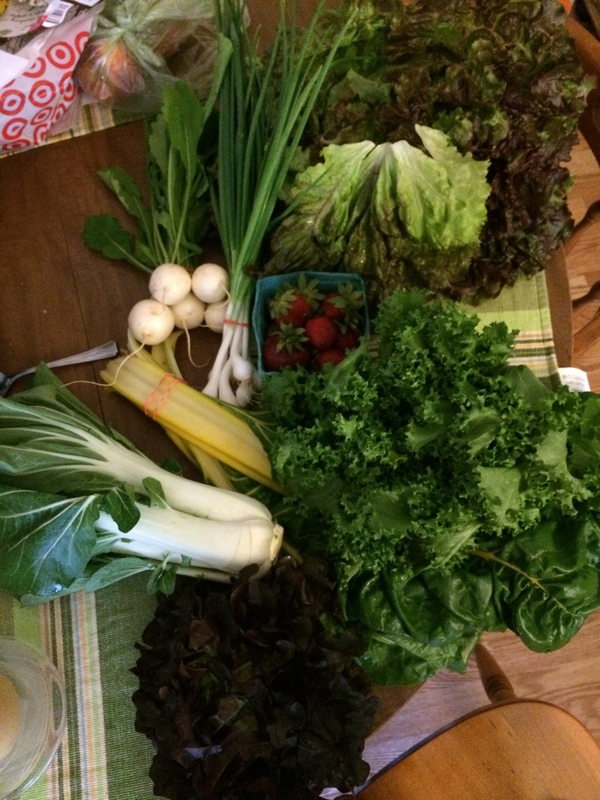 From top: white hakurei turnips, white scallions, strawberries, red leaf lettuce (yes, that’s a huge head, kind of flopped over), yellow chard, frisee, bok choy, salanova lettuce. Lots of salads were in the cards this week, obviously.